It isn’t every day that we get to announce a handsome twentieth anniversary edition of a book that we think is among the most important and beautiful and influential of our lifetimes. 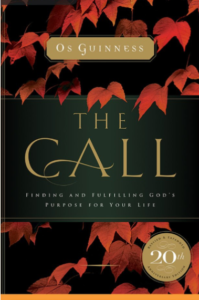 I am thrilled to announce (again) a new, expanded edition of The Call: Finding and Fulfilling God’s Purpose for Your Life by Os Guinness (Thomas Nelson; $16.99.) It is a book we esteem greatly and is in the handful of “must reads” that I often cite as central to our own story here. We hope you know it, and sincerely hope you enjoy my brief rumination. We are offering this at 20% off, making our price $13.59. You can order by visiting our secure order form page at the website, shown below, by emailing, or calling. 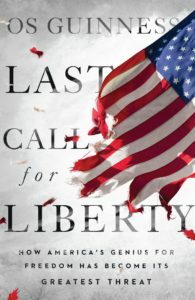 Dr. Guinness, by the way, has another brand new book entitled Last Call for Liberty: How America’s Genius for Freedom Has Become Its Greatest Threat (IVP; $27.00) which details an urgent challenge for us to be clear about the importance of freedom in our fraying civic culture, but I will tell you more about that later. 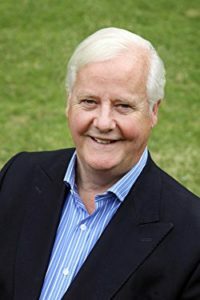 For now, I want to express my deep appreciation for Guinness and his large body of work and remind you about why I so value this new edition of his most-read, classic book, The Call. As I have written elsewhere (and often explain in doing talks about uniquely Christian approaches to cultural engagement and the significance of reading for spiritual formation) my own faith and posture towards culture, even my very worldview and understanding of faith was significantly shaped by Guinness’s first book, the now out-of-print classic The Dust of Death. It was the first thoughtful Christian book of social criticism that I read and it set me on a journey that included, eventually, Beth and I starting the bookstore in the early 1980s. Dust was a study of the social crisis of the 1960s and early 1970s and it offered an astute Christian evaluation and called us to be Biblically-shaped salt and light, in but not of, agents of God’s reconciliation. From the efficient, gray-suited businessmen in the materialistic, Cold War 50s to the bohemian beatniks and early 60s folksters on the road with Jack Kerouac to the flower-power hippies of the counter-cultural late 60s to the political activists of the early 70s during the tail-end of the Viet Nam war, the draft, and Watergate (which included the rise of groups like the Black Panthers and the Symbionese Liberation Army not to mention the Jesus movement) Guinness told the big picture story of the spirits of the times and the idols of the age. He used his incisive mind and eloquent prose and wide world background (he was born in China, son of Irish missionaries, although later spent time in an ashram in Nepal and studied with brilliant atheists at Oxford) to channel Francis Schaeffer’s good heart for disenfranchised youth and troubled or morally serious seekers. He offered which was at least for me the first coherent Christian social theory that promoted a Kingdom vision, a third way between the left and the right, critiquing the unhelpful idols of both the conservative and the liberal streams of the secularizing Enlightenment. I was honored to hear Dr. Guinness in the 1970s when he did a series of keynote addresses at our Pittsburgh Jubilee conference. We interacted with him at other events where we sold books – an old event called Ivy Jungle and programs sponsored by the C.S. Lewis Institute in DC and the Christian Legal Society. He was gracious enough to visit York several times as we hosted him here. For those that have read his books and enjoyed the company of him and his wife, you will know I’m bragging a bit here as it has been an true honor to have him encourage us in our bookstore work. Having said all that, I want to remind you that The Call was one of the first contemporary, popular level books that developed the implications of this most important (but routinely misunderstood) theological doctrine, that of “calling” (and its related theme, “vocation.”) There is a huge renaissance of books on faith, calling, discernment, vocation, work, and serving God in varying spheres of society these days, and nearly all owe their moment to a series of talks Guinness did in the 1990s (including at York First Presbyterian Church) and the celebrated release of this seminal book in 1998. I do not think I am alone and I do not think I am wrong to suggest that the faith and work movement, the rise of marketplace ministry courses, the popular spread of conferences and workshops using the language of vocation and Christian views of work-a-day routines owe their existence in our time to how God was pleased to use this book as it was embraced by key leaders within the thoughtful end of the evangelical world. That is, much of what we do here at Hearts & Minds – selling books at large and influential events from Jubilee in Pittsburgh to the Center for Faith and Work at Redeemer in New York City to my wonderful experience this past weekend at the Colorado Christian Business Alliance conference in Denver – comes back to evangelicals who want to connect Sunday and Monday, worship and work, and to live out (as Os’s long-time friend, Steve Garber puts it eloquently) Visions of Vocation. Indeed, Garber’s sub-title, “Common Grace for the Common Good”, shows how this wholistic vision of relevant discipleship, robustly rooted in the doctrine of God’s call upon us, has vast, public consequences. Not only do I want to announce that Guinness’s classic is now expanded and revised (and has great study questions in the back) I want to say it is as relevant as ever. Who isn’t searching for purpose these days? Who doesn’t want work to be worthwhile, careers to be callings, to find a “why” to our existence? (“Start with Why” a current best-seller advises.) But, as Guinness says in a provocative, stimulating, new opening chapter, there is considerable apologetically power when we bear witness to a life of meaning by working with this material, but realizing its implications. It should be obvious, but isn’t, that there can be no calling without a Caller. We can’t really have purpose without One who offers a coherent life, in a creation created in such a way as we can fit into a plan. That is, the deepest Christian truths – not slogans or debatable doctrines – are universal, illuminating the really real, for everyone, everywhere. We can find a way of life that is rich and good and meaningful and even find our purpose and personal fulfillment when we see all of life as created good, if fallen, and the get that the meaning of life is found in participating in God’s reconciliation of the world, in our own ways, according to God’s call. Yet, even if that has compelling weight and “preaches well” we have to be aware of what Guinness calls “clichés and counterfeits.” His earliest chapters are exposes of unsustainable notions and more reliable foundations (even if what some might find the most dense.) It’s good stuff. I love the core chapters where he explains how the Protestant reformation blew apart the sacred/secular dualism of the medieval world. Monks and nuns were the only ones, in those dark ages, who were allowed to say they were “called.” Indeed, Martin Luther said “the men making the beer barrels and the women milking the cows are as important to the Kingdom God as the priests and the nuns.” They wanted to arrest him for such talk! William Tyndale, years earlier, was burned at the stake and one of the reasons was because he dared to say ordinary folks could use the language of vocation, that their work mattered to God. Guinness’s chapter about a Dutch monk that locked the doors of the church so folks wouldn’t obsess with liturgy, but take faith into daily life, called “Locked Out and Staying Out”, is worth the price of the book. His central chapters “Everyone, Everywhere, Everything” and the follow-up “By Him, To Him, For Him” and the often-cited “The Audience of One” chapter are all simply unforgettable. For anyone guiding others in vocational discernment, this solid teaching about calling (both our primary calling to follow Christ and our secondary callings to various offices and tasks) is crucial. “Be What You Are” is the sort of eloquent wisdom that will clarify much – and there is much to be clarified these days, with everybody from MBA programs and edgy entrepreneurs and church preachers insisting everyone must make a difference and find zeal in doing all kinds of spiffy stuff, finding your bliss and whatnot. This is sturdy, level-headed ballast, and exceedingly helpful as we think through things like jobs and happiness and occupations and retirement and such. That is, he reminds us not to overly identify our callings with our jobs. In a world as fallen as ours, in a culture arranged as ours, we may not find that our callings and careers are the same. If we’re lucky, it might be somewhat so. For those in mid-life or beyond there is much assistance here, too; there is even a chapter on “Fighting the Noonday Demon” which is profound for those struggling with depression or what the ancients called sloth, or despair. His bit about time is excellent, and, for those with curiosity about such things, his reflections will make you wise about the pressures of the modern world. A few years ago I edited a small volume of Christian college commencement speeches extolling folks to live into their callings, to take up their vocations in the world. 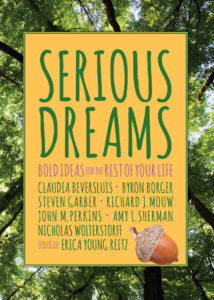 We called it Serious Dreams: Big Ideas for the Rest of Your Lives (Square Halo Books; $13.99.) It’s one of the things I’m most proud of, although I still wish I could have found a talk of Guinness’s to put in there. Voices similar to Guinness are compiled – Steve Garber, Amy Sherman, Nicholas Wolterstorff, Richard Mouw, Claudia Beversluis, Erica Young Reitz, and the always inspirational wonder, civil rights activist, Dr. John Perkins!) Each of us in Serious Dreams are saying stuff to encourage young adults in that little anthology that mirrors much of what Guinness is doing here; I suspect strongly that each contributor had read it. I advise any young adults wanting some inspiring talks, homilies to get you going, friends on the printed page to help you along to pick up Serious Dreams. But to be really clear about their future and to be instructed well, for life, they should dig in and study Guinness’s remarkably substantive and formative book. I would rather you buy his book than my book! Calling is more than just a matter of being zealously positive about a career track or naming a desire to make a difference or slapping on the word vocation. A deeper appreciation for the lasting profundity of this stuff is both a great, liberating gift and comes with a deeply serious conviction to follow Jesus. As Guinness says, we are “people of the call” and “followers of the way.” This is key, central, life-changing, solid-as-a-rock Christian commitment. In other words, this book is for nearly anyone, any educated adult wanting to understand their lives, their faith, their deepest source of meaning. You should know three quick things about The Call. Guinness is a master of making good points, offering a few sub-points, showing the threats or dangers or counters to those points, and summarizing each. For those that like sort of logical teaching, detail upon detail, close expression, bit by bit, this will thrill you with the sheer weight of fine content. Some of his legendary talks and other vital books are nearly byzantine in their expertly designed structure, but it always works. And, of course, there are well-placed quotes from fabulously interesting figures from Winston Churchill to Dorothy Sayers, from John Calvin to John Wesley, from Kafka to Carnegie. Secondly, he always illuminates each chapter with a grand story or pithy illustration. The Call is, in fact, more story-driven than any of his always- impressive writings. He tells stories of jazz players and politicians, painters and farmers, explorers and executives. I will never forget the story telling of how a poor Irish farmer plowed his fields with a learned craft and God-glorifying stewardship and the life-saving impact that had. His chapter “Dreamer of the Day” is about T.E. Lawrence, the larger than life leaders known as “Lawrence of Arabia” and it is thrilling. Most readers don’t know much about the lives of old Puritans or modern existentialists or explorers or business titans or painters, and Guinness uses history and his own biography and tons of stories as key illustrations. What a literary feast this is, learned and inspiring. Thirdly, this is written almost like a daily devotional; the chapters are dense, but relatively brief. There is a thought-provoking question at the end of each chapter and a closing prayer. It would be a transforming practice to read a chapter a day for 30 days, or once a week, even, for half a year. Why are we here? What is God’s call in our lives? How do I fit God’s call with my own individuality? How should God’s calling affect my career, my plans for the future, and my concepts of success? For centuries, finding purpose in life has been at the heart of the human quest. Yet, for many, the path to purpose remains urgent but unclear. 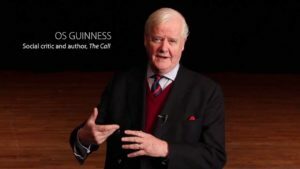 In this bestselling modern classic, Os Guinness invites you to explore the ultimate answer to identity, meaning, and purpose. The Call speaks to the longing in every human heart and provides an answer – You were created for a purpose. In this new edition, The Call further enriches your search for purpose with multiple new chapters from the author, along with a practical study guide to accompany you through your own journey or to facilitate group exploration. This book is for all, seekers and believers, who long to find and fulfill God’s purpose for their lives. Have you found “the ultimate why” for your life? Will you respond to the call? In modern Christian literature there is nothing quite like Os Guinness’s classic The Call, now made more valuable with additional material. Highly recommended.